You purchase a software product, deploy it into your production environment and then become completely dependent on it over the years. Does this sound all too familiar? For most us, this situation is quite familiar and, unfortunately, we have been left asking ourselves what to do when the software company pulls the plug on the technology. This is an even more important aspect nowadays with security products as they come and go. 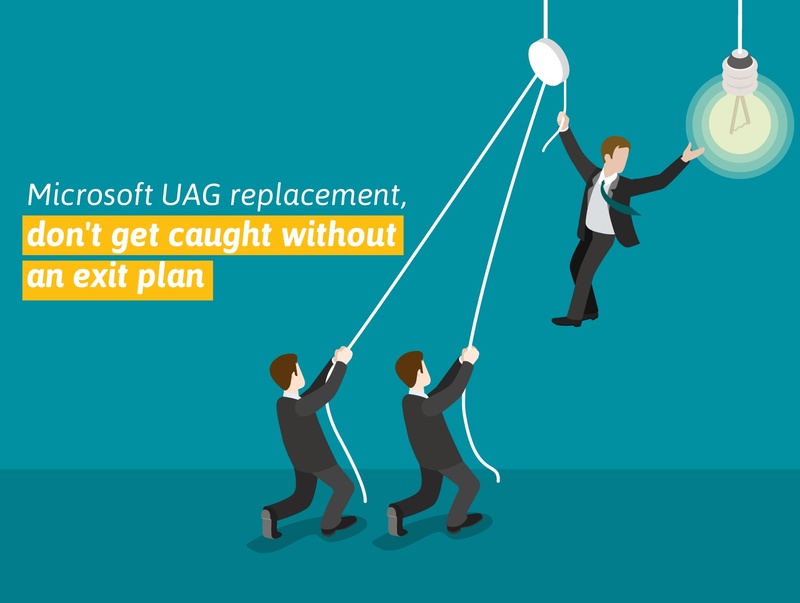 Microsoft announced end of life for the Forefront Unified Access Gateway (UAG) and ended mainstream support in 2015 with only limited extended support for several years. Therefore you must find a product replacement or alternative. What is UAG? It is a software solution that was released in 2010 and provides secure remote access to enterprise networks for remote employees and business partners. It incorporates remote access technologies such a reverse proxy, virtual private networks (VPN), DirectAccess, and Remote Desktop Services . As mentioned, Microsoft is only offering extended support for a limited time, but the unknowns of that type of limited support must have left you, like many others, with concerns about what to do. Securing remote connections for employees and business partners is absolutely critical in preventing cyber criminals from accessing your computer environments and your critical data. Yes, whether you want to believe it or not, cyber criminals are actively hacking your environments and letting your guard down, just because a critical security product isn’t being fully supported any longer, isn’t the solution. I’ve been in this situation many times during my career running enterprise mission-critical platforms. Outlined below are several suggestions to help you move forward and find a new solution. Understand what type of product support you will receive for the end of life technology. Including: will you receive necessary security patches, technology fixes or updates? Not all security products are created equally and offer varying benefits and risks. Take a close look at a comparison matrix of features and functions of the product set that you intend to review as a replacement. Once you are comfortable that you have a product set that will replace your current use cases, get the product into the development lab and run a proof of concept. I can’t stress enough; look for not only success criteria in your testing, but also for any negative outcomes that the proposed new product might introduce into your platform and environments. If you conduct thorough proper due diligence, it’s highly likely that the replacement product will provide enhanced features in addition to the use cases that you have been using for years. Take that step now to make a change and find a Microsoft Forefront Unified Access Gateway replacement or alternative. Do not wait until you have a security breach and information is compromised because a critical patch or security update was not made available.